MagicCatJenny: How To Use Adproval & a Giveaway! 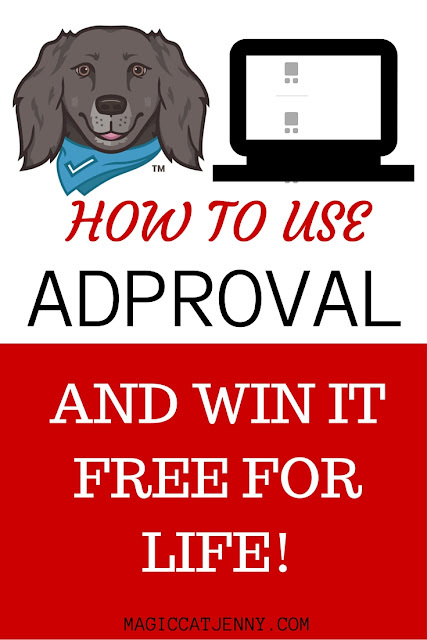 How To Use Adproval & a Giveaway! I've been blogging for years, but I've been blogging on this blog for the past 5 years. I've also been ad swapping (and even selling the occasional ad, whoo!) for that long. I started the way most blogs start by manually adding the codes and reminding myself to take them down after the agreed upon time. It was work, so I found a free service that would automate it and even provide a marketplace to help promote my blog. After a bit that place was no longer free, that's when I found Adproval. (I talked about my switch back in 2013, here.) Also, in case you missed it, I talked about Adproval yesterday in a video! Adproval is free, easy, and accessible. What I mean by accessible is the customer service is wonderful. When I have a question or problem it's been no problem talking to a person to help me out. Signing up for an account and ad swapping is free. When you do decide to start selling ads, there is a processing fee of 2.9% + $0.30. (Which is the case with Etsy and other online businesses.) Adproval then takes an additional 10%. Not bad when you remember you're not paying anything upfront. In fact, I'm running a giveaway at the end of this post, where 3 of you will win free Adproval for life. You'll still have the processing fee but Adproval won't take out that 10%. If you're already a fan of Adproval, skip to the bottom and enter! If you're still wondering how this all works, read on. The fist thing you need to do is set up the type of ads you want to sell/swap. You chose the name, size, location on your blog, and write a short desiciption. You can choose how long the ad will run and how much it costs. There is also a box you can check to make it avalable for a free swap. Once you've created your offerings you need to create your ad store widget. You can ad your monthly blog traffic (collected by Google Anaylitics) and your social stats from Twitter, Facebook, and Instagram. All of this is set up and can be updated in your account profile. When someone requests an ad swap or buys an ad you will see it in the contracts page. You can accept or deny contracts, view active and pending contracts, and even message the person. There are other features that Adproval has to offer, such as the ablity to offer promo codes for your ad spaces and browse the marketplace for sponserships and blog swaps. The Giveaway ends April 13th at 12am EST. Open to anyone,but you'll need an Adproval account to activate your prize. Winners will be selected at random and be notified by email. Winners email will be sent to Adproval to activate the prize. Winner have 48 hours to respond before a new winner is selected. The product offered for the giveaway is free of charge, no purchase necessary. 'Free' means no 10% fee for selling ads but you still have to pay the processing fee of 2.9% + $0.30.